Apollo 18 is a 2011 American-Canadian alternate history found footage science fiction horror film written by Brian Miller, directed by Gonzalo López-Gallego, and produced by Timur Bekmambetov and Michele Wolkoff. After various release date changes, the film was released in the United States, United Kingdom, and Canada on September 2, 2011; however, the release dates for other territories vary. The film is López-Gallego's first English-language movie. The film's premise is that the cancelled Apollo 18 mission actually landed on the Moon in December 1974, but never returned, and as a result the United States has never launched another expedition to the Moon. The film is shot in found-footage style, supposedly "lost footage" of the Apollo 18 mission that was only recently discovered. Grey remains in orbit aboard the Freedom command module while Walker and Anderson land on the Moon in the lunar module Liberty. While planting one of the detectors, the pair take rock samples. After returning to Liberty, the pair hear noises outside and a camera captures a small rock moving nearby. Houston claims the noises are interference from the ICBM detectors. Anderson finds a rock sample on the floor of Liberty despite having secured the samples. During further lunar exploration they discover footprints that lead them to a bloodstained, functioning Soviet LK lander, and a dead cosmonaut in a nearby crater. Walker queries Houston about the Soviet presence, but he is told only to continue with the mission. The following day the pair find that the flag they had planted is missing. Their mission complete, the crew prepares to leave, but the launch is aborted when Liberty suffers violent shaking. An inspection reveals extensive damage to Liberty and their flag shredded. Walter finds non-human tracks outside Liberty, and cites them as evidence of extraterrestrial life. Walker feels something moving inside his spacesuit and is horrified as a spider-like creature crawls across the inside of his helmet. Walker disappears from view and Anderson finds him unconscious outside of Liberty. Walker later denies the events. A wound is discovered on Walker's chest; Anderson removes a Moon rock embedded within him. After having removed the rock, Walker then destroys it with a hammer. The pair find themselves unable to contact Houston or Grey due to increased levels of interference from an unknown source. Anderson speculates that the true intention of the ICBM warning devices is to monitor the aliens, and that the devices are the source of the interference, only to discover something has destroyed them when they attempt to switch them off. Walker shows signs of a developing infection and he becomes increasingly paranoid. The mission cameras capture the rock samples moving around in the interior of Liberty, revealing that the aliens are camouflaged as Moon rocks. Increasingly delusional, Walker attempts to destroy the cameras within Liberty, but he accidentally damages the system controls, causing Liberty to depressurize. Realizing the Soviet LK is their only source of oxygen, the pair travel to the LK lander in their lunar rover. Walker causes the vehicle to crash as he runs away, believing he should not leave the Moon, because of the risk of spreading the infection to Earth. Anderson awakens and tracks Walker to the crater where they found the cosmonaut. Walker is pulled into the crater by the creatures. Anderson gives chase, but he is confronted by the aliens, and flees to the Soviet LK. Anderson uses its radio to contact USSR Mission Control who connect him to the Department of Defense. The deputy secretary informs Anderson that they cannot allow him to return to Earth, admitting they are aware of the situation and incorrectly believe he is also infected. Anderson manages to contact Grey and they make arrangements for Anderson to return to Freedom. Anderson prepares the lander for launch, but Walker arrives, revealing he had survived the alien encounter earlier. However, he is now completely psychotic and demands to be let in. When Anderson refuses to let him in, he tries to break the lander's window with a hammer. Before Walker can enter the vehicle, he is attacked by a swarm of creatures inside his helmet, which causes his head to explode, killing him. Anderson launches, but the DoD warns Grey that Anderson is infected and orders him to abort the rescue or communication will be cut off, without which the CSM will be unable to return to Earth. The lander's engines shut off as it enters orbit, and it is in free fall. Small rocks within the craft float in the air, some of which reveal themselves to be alien creatures. Anderson is attacked and infected by the creatures, preventing him from controlling the vehicle. Grey tells Anderson that he is moving too fast as the LK speeds towards Freedom, and the space footage ends abruptly, as the LK and Freedom collide, killing them both. The film concludes with a statement giving the "official" fate of the astronauts, describing them as having been killed in various accidents that left their bodies unrecoverable. An epilogue explains that many of the rock samples returned from the previous Apollo missions are now missing. Apollo 18 was shot in Vancouver, British Columbia. However, it has been promoted as a "found footage" film that does not use actors. In an interview with Entertainment Weekly, Dimension Films head Bob Weinstein "balk[ed] at the idea" that the film was a work of fiction, stating that "We didn't shoot anything; we found it. Found, baby!" The Science & Entertainment Exchange provided a science consultation to the film's production team. NASA was also "minimally involved with this picture," but declined to go further with the project. The film is distributed by Dimension Films. Four alternate endings and one deleted scene are included in the DVD releases. In the first ending, Anderson is in the LK. Walker is attacked by the creatures on his helmet, and his head explodes, killing him. Then, Anderson is surrounded by the aliens as the LK loses oxygen and he dies. The alien then leaves the shot, concluding the first alternate ending. In the second ending, Anderson is in the LK, under siege by the aliens. Suddenly, an alien breaks the window of the LK and kills Anderson with a pincer. In the third ending, an infected Anderson is in the LK after colliding with the Freedom, where Grey was. An alarm begins to sound as the lander plummets back to the Moon, having failed to reach escape velocity due to its collision with the Freedom. The scene ends with what one could assume to be an impact with the surface of the Moon, and Anderson's subsequent death (even if Anderson survived the crash, he would still have to contend with his infection, the barrenness of the Moon, and the hostile aliens). In the final ending, Grey is seen arguing with a DoD member back on Earth, showing that Grey survived the ordeal. A single deleted scene details the fate of the Russian Cosmonaut. The film concludes with a statement that the Nixon Administration gave away hundreds of Moon rocks to foreign dignitaries around the world, and that many of these Moon rocks have been lost or stolen. This is actually true; both the Nixon and Ford Administrations gave away 135 Apollo 11 Moon rocks and 135 Apollo 17 goodwill Moon rocks. The Moon Rock Project, a joint effort of over 1,000 graduate students started at the University of Phoenix in 2002, has helped track down, recover or locate many Moon rocks and found that 160 are unaccounted for, lost or destroyed. In 1998, a sting operation, called Operation Lunar Eclipse, made up of personnel from NASA's Office of the Inspector General, the U.S. Postal Inspection Service and U.S. Customs recovered the Honduras Apollo 17 goodwill Moon rock, valued at $5 million. In October 2011, NASA agents raided a Denny's restaurant and arrested a 74-year-old woman for attempting to sell a Moon rock from Neil Armstrong for $1.7 million on the black market. Apollo 18 was released on September 2, 2011 in multiple countries. Originally scheduled for February 5, 2010, the film's release date was moved ten times between 2010 and 2011. The film was released December 27, 2011 on DVD, Blu-ray, and online. Special features include an audio commentary with director López-Gallego and editor Patrick Lussier, deleted and alternate scenes and endings, including footage of how the Russian cosmonaut died and 4 alternate deaths of Ben Anderson. Apollo 18 has received mostly negative reviews from critics. On the online reviews site Rotten Tomatoes, the film was given a 24% "rotten" score based on 71 reviews, with the consensus "A boring, suspense-free Paranormal Activity rip-off that feels long even at just 90 minutes", and Metacritic, which gives an aggregate score between 0 and 100, gives the film a 24 based on 19 critic reviews, which indicates "generally unfavorable reviews". Conversely, Fred Topel of CraveOnline gave the film a positive review, saying that the film "will shock you to your core" and that the last 10 minutes "are the most exciting of any summer movie, and without motion capture effects." 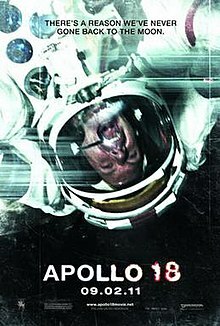 At the end of its run in 2011, Apollo 18 had earned $17,687,709 domestically, plus $7,875,215 overseas for a worldwide gross of $25,562,924 against a $5 million budget, becoming a financial success. In its opening weekend, Apollo 18 screened in 3,328 theaters and opened in number 3, earning $8,704,271, with an average of $2,615 per theater. In its second weekend, the film earned $2,851,349, dropping 62.7%, with an average of $856 per theater, dropping to number 8, but still had a higher total gross at that point over Shark Night 3D, another horror film opening the same weekend as Apollo 18. ^ "Apollo 18 (15)". British Board of Film Classification. August 25, 2011. Retrieved August 28, 2011. ^ a b c "Apollo 18 (2011)". Box Office Mojo. September 2, 2011. Retrieved October 26, 2011. ^ a b "Apollo 18 has its release date moved for the fifth time". ^ "British Columbia Film Commission Film List: January 11, 2011" (PDF). British Columbia Film Commission. Archived from the original (PDF) on September 28, 2011. ^ Tim Stack. "'Apollo 18': Details on the super-secret new sci-fi flick". Entertainment Weekly. ^ "Project". National Academy of Sciences. Archived from the original on July 26, 2011. Retrieved July 7, 2011. ^ Keegan, Rebecca (September 1, 2011). "NASA reaches its outer limit". Los Angeles Times. Retrieved September 14, 2011. ^ "New Apollo 18 Viral Examines Why We Haven't Been Back to the Moon". ^ In Search of the Goodwill Moon Rocks: A Personal Account Geotimes Magazine. November 2004. ^ NASA agents raid Denny's in undercover sting—after woman, 74, tries to sell moon dust that was gift from Neil Armstrong Mail Online, October 24, 2011. ^ McWeeny, Drew (January 7, 2011). "'Apollo 18' game revealing new clues about SF conspiracy thriller". Retrieved January 7, 2011. ^ Yamato, Jen (March 25, 2011). "Weinstein Co. Pushes Apollo 18 Release Back to January 2012". Movie Line. Retrieved June 22, 2011. ^ "Apollo 18 Lands On Another Release Date". ^ "Release Date News: 'Apollo 18,' 'Piranha 3DD,' 'Our Idiot Brother' and 'I Don't Know How She Does It'". ^ "A Nice Change Of. Pace: 'Apollo 18' And 'Final Destination 5' Move Up". ^ "Apollo 18". Rotten Tomatoes. Retrieved July 31, 2018. ^ "Apollo 18 Reviews, Ratings, Credits, and More at Metacritic". Metacritic.com. Retrieved October 26, 2011. This page was last edited on 24 March 2019, at 18:20 (UTC).